Your mouth reveals a lot about your overall wellness. As medical science has established, your oral health and general health are closely related. While your doctor is generally the person you expect to detect evidence of disease, your dentist may discover early signs and symptoms even sooner. In fact, dentists are often the first to recognize signs of eating disorders such as anorexia and bulimia. Erosion of teeth and other signs of eating disorders often manifest first in the mouth, and they may develop early in the course of the illness. Common dental symptoms associated with eating disorders include swollen salivary glands, cavities, dry mouth, erosion of teeth, tooth sensitivity, and mouth sores. Bulimia effects on teeth are usually related to repeated, self-induced vomiting that exposes teeth to potent stomach acids that eat away at enamel. Brushing after vomiting intensifies the damage. 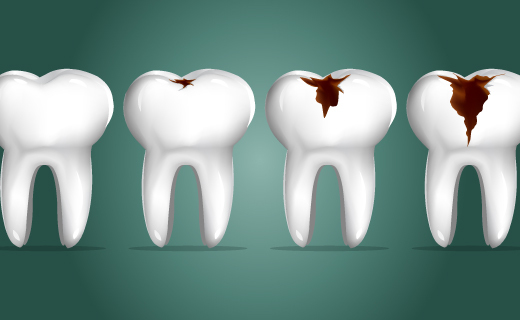 Multiple cavities in a short period of time can be another sign that your eating disorder and teeth have crossed paths. Who Is at Risk of Developing Eating Disorders? The majority of people who suffer from eating disorders are females ranging from 12 to 25 years of age. Statistics reveal that up to 10 percent of anorexia victims die within 10 years of developing the disorder. Another 20 percent die within the next 20 years, and only 30 to 40 percent achieve a full recovery. People at highest risk of eating disorders include those whose careers depend on aesthetic factors or weight such as athletes, dancers, models, and actors. However, anyone can be affected. Anorexia and bulimia effects on teeth are minor compared to their impact on your general health. Inadequate nutrition eventually results in poor general health, depressed immune function, and organ failure. If you think you may have an eating disorder, discuss it openly with your dentist. Although dental professionals can’t treat the underlying cause of your condition, they can help you find treatment resources, and offer tips and suggestions to help reduce the ongoing erosion of teeth and other damage to your teeth while you recover.